The prototypes for the planed building of a new wall on the American - Mexican border. Donald Trump wants to put his plan into action next year. San Diego, USA, Mai 2018. Construction of the borderfence between the US and Mexico between Naco and Douglas, Arizona. April 2008. The village of Burj next to the separation wall in the south-western part of the Westbank.. Occupied Palestinian Territories, November 2018. A madonna painted on the separation wall next to the entrance checkpoint of Bethlehem. Soldiers regulary erase graffity which is painted next to the checkpoint though the icon wasn´t painted over. Occupied Palestinain Territories, January 2018. The recently built wall around the ferry port of Calais. The wall should prevent immigrants from getting onto boats to England. France, February 2018. Tents of refugees in the early morning next to the Macedonian - Greek border in Idomeni, Greece. March 2016. A wall in the Shiite neighbourhood of al-Qahira in Baghdad which separates it from the Sunni neighbourhood of al-Athhamia. The flags are put up for the Shiite holiday of Arbaeen. Iraq; January 2012. Shurja market in downtown Baghdad is heavily secured through concrete walls and Iraqi army. It saw the worst bombings in the the Iraqi war. On Fridays as in this picture it is closed for traffic and mostly deserted. Iraq, January 2012. A fence and watchboth in the Spanish enclave of Mellila separating it from Marocco. In the background the Mediterian Sea. The fence was erected over the last decade to prevent immigration from Africa to the European Union. The enclave has still a big presence of Spanish soldiers here seen during a training, while coordinating their training with the Guardia Civil which is in charge of guarding the border. March 2009. Marrocans pushing package of clothes towards a borderentrance to Marroco from the Spanish enclave of Mellila. The fence was erected over the last decade to prevent immigration from Africa to the European Union. Melilla, Spain, 2009. A peaceline at Cluan Place in East belfast. The wood is prepared for a bonfire which will mark the victory of William of Orange over the Catholics on 11, July 1690. They are lit all over Northern Ireland in the night from 11 to 12, July. In former decades there were a lot of confrontations between Catholics and Protestants nowadays its stays mostly quiet. Northern Ireland, July 2010. A section of the biggest “Peace Line” of West Belfast at the crossing of First Street and North Howard Street which was reinforced with concrete and build higher in 2008. It separates a Catholic and a Protestant neighbourhood. Northern Ireland, September 2008. Metall wall marking the demarcation line between Turks and Greece in the center of Nicosia, Cyprus. October 2010. South and North Korean military police officers standing next to the barrack where the armistice between North and South Korea was signed in 1953. The curb marks the demaration line between the two countries. To the left an American soldier. Panmunjom, Demilitarized Zone, Korea. September 2009. A wall running through Shiite Sadr City in Baghdad. The wall was erected by the US army to protect an area from attack of the Mehdi Army, a Shiite militia following Muqtada al-Sadr, a Shiite cleric in the rank of a Sayyid. The wall is still in place and heavily guarded by the Iraqi army. Iraq, January 2012. The illegal Israeli settlement of Pisgat Zeev in the Westbank seen from the Palestinian refugee camp of Shuafat in the outskirts of Jerusalem. Though the separation wall divides the inhabitants of these communities they both hold Jerusalem identity cards. Occupied Palestinian territories, November 2009. An Iraqi soldier controlling a pedestrian exit/entrance to the neighbourhood of Bayya in Baghdad. The quater is completely surrounded by wall and canonly be enteres by checkpointsl. Iraq, January 2012. A wall running through Shiite Sadr City in Baghdad. The wall was erected by the US army to protect an area from attack of the Mehdi Army, a Shiite militia following Muqtada al-Sadr, a Shiite cleric in the rank of a Sayyid. The wall is still in place and heavily guarded by the Iraqi army but inhabitants hit a number of holes in it or removed slabs. Iraq, January 2012. Borderwall between the United States and Mexico running on the bank of the Tijuana River. The borderline runs through the river in this spot. The poster is asking for information on a person that went missing in that area. Tijuana, Mexico. October 2008. The illegal Israeli settlement of Pisgat Zeev in the Westbank seen from the Palestinian refugee camp of Shuafat in the outskirts of Jerusalem. Though the separation wall divides the inhabitants of these communities they both hold Jerusalem identity cards. The graviti work is an action of Palestinain artists from Jerusalem. Everybody around the world could contact them and get his quote written on the wall by them. Occupied Palestinian territories, November 2009. Railwaybridge over the Rio Grande between Juarez on the Mexican side and El-Paso on the US side. The bridge is part of the border fortification between the two countries. April 2008. The "sunken road", the connecting road between the Westbank and the Bir Nabala enclave, three villages of Jerusalem that are completely surrounded by walls and fences. Occupied Palestinian Territories, November 2009. A wall running along the border of the Spanish enclave of Ceuta separating it from Marocco. The wall and fences were erected over the last decade to prevent immigration from Africa to the European Union. The porters bring goods over to Marroco on a daily base. March 2009. Palestinian workers from Bethlehem waiting to pass through a checkpoint in the wall to get to their work in Jerusalem. Occupied Palestinian Territories, November 2009. The very end of the Mexican-US border running into the Pacific Ocean in Tijuana, Mexico. November 2008. A separation wall between a Catholic and a Protestant neighbourhood next to Duncairn Gardens and Hillman Street in Westbelfast. Northern Ireland, September 2008. The “Peace Line” (a separation barrier between Catholics and Protestants) in Culpar Way, Westbelfast is illuminated by a bonfire. The puppet symbolises the pope. Every year the Protestants commemorate their victory over the Catholics on 12th, July 1690 with marches and bonfires. July 2007, Northern Ireland. South Korean military police officers stnading in the barrack where the armistice between North and South Korea was signed in 1953. Panmunjom, Demilitarized Zone, Korea. September 2009. U.S. Border Patrol officers negoating with activists who had put up a protestcamp on both side of the Mexican-US border. The officers wanted to make sure nobody entered the US from the Mexican side during the protest. Calexico, California, USA. November 2007. Garden of a Palestinian in Nazlat Isa in the Northern Westbank. Here the ceasefire line from the war in 1948 runs straight through the Palesinain town og Baqa al-Rarbiya (Baqa West) which belongs to Israel and Nazlat Isa which belongs to Baqa al-Scharqiya (Baqa East). In 2004 the Israeli government built a wall through the city separating the community and their families. Before 2000 the town was a busy place for trade between the Palestinians in the Westbank and Israel. For the building of the wall 105 shops and seven houses were destroyed. Occupied Palestinian Territories, December 2010. Protection wall of the Kibbuz Netiv ha-Asara against small arms fire from the Gaza Strip. Israel, November 2010. Destroyed Shacks next to the Mexican-US border in Tijuana, Mexico, April 2007. A section of the biggest “Peace Line” of West Belfast in Waterville Street, which was reinforced with concrete and extended with a fence on the top in 2008. Children cut a small hole in the fence to get access to the lawn. Belfast, Northern Ireland, September 2008. Gate in a wall next to the Palestinian village of Ni´ilin. The black grenades are teargas canisters thrown over the wall by Israel soldiers during protest against the wall. Occupied Palestinian Territories, November 2010. A blocked street in the center of the Nicosia seen from the Greek - Zypriot side. The sign says "Stop your are entering the Turkish occupied zone". Cyprus, February 2012. The view from the illegal Israeli settlement of Pisgat Zeev in the Westbank towards the Palestinian refugee camp of Shuafat in the outskirts of Jerusalem. Though the separation wall divides the inhabitants of these communities they both hold Jerusalem identity cards. Occupied Palestinian territories, November 2009. A "Peace Line" a separation wall between Catholic and Protestant neighborbourhood in Bryston Street, East Belfast. July 2006, Northern Ireland. Memorial for the border patrol officer Robert W. Rosas who was shot and killed by unidentified assailants. The murder occurred in a remote border area near Campo on Thursday, July 23, 2009. The murder is very probably related to immigrant drug smuggling. Campo, California, 2011. Wreaths for the people who were killed crossing the Berlin Wall next to the memorial of the Berlin Wall in Bernauer Strasse on the the occasion of the 50th anniversary of the building of the Berlin Wall on 13, August 1961. Berlin, Germany, August 2011. Mexicans walking along the Mexican-US border in Tijuana. The background shows the newly constructed concrete barrier and the old red metal wall. Tijuana, Mexico, April 2007. A section of the biggest “Peace Line” of West Belfast in Waterville Street, which was reinforced with concrete and build higher in 2008. Belfast, Northern Ireland, September 2008. Cattle coral on the Mexican side of the Mexican-US border at the Miraposa crossing next to Nogales, Arizona. Mexico, April 2008. Piece of not finish wall between the Israeli settlement of Modi´in Illit and the Palestinain village of Bili´in. After a highcourt descision the wall was rerouted an the village got back a part of its agricultural land in June 2011. Occupied Palestinian Territories, November 2010. Mexicans are trying to start a car next to the old and new border barrier in Tijuana, Mexico. November 2008. Walls marking the Turkish side of the demarcation line between Turks and Greece in the center of Nicosia, Cyprus. October 2010. Memorial for the victims of the Berlin Wall in the Marie-Elisabeth-Lüders House in the German parliament. Berlin, Germany, August 2011. Observation post of the Korean army in the demilitarized zone between North Korea and South Korea. The US army is also controlling this part of the zone as part of a UN force. Panmunjom, Paju, Repubulic of Korea. September 2009. The fence of the Spanish enclave Mellila separating it from Marocco. The fence was erected over the last decade to prevent immigration from Africa to the European Union. April 2009. Pieces of destroyed wallslabs from Israeli settlements in Gaza used by the Palestinian Authoriy as breakwater wall in the fishing habour of Gaza. Occupied Palestinian Territories, November 2010. Remains of the Berin wall at the Teltow Canal in the South of Berlin. Germany, August 2010. 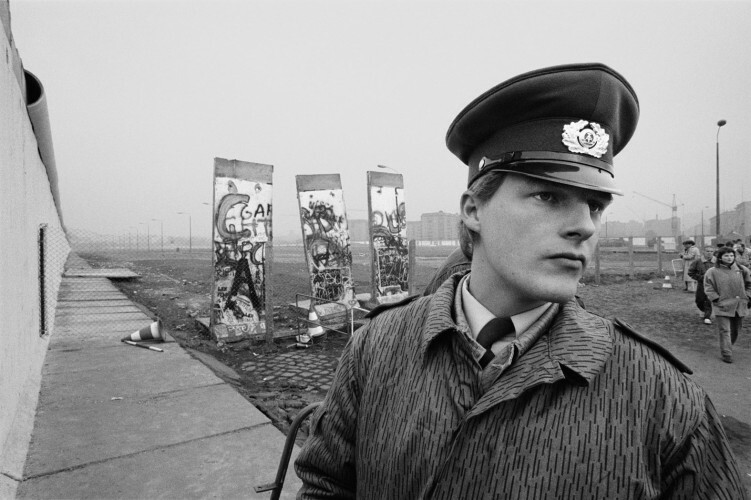 An East German border guard watches East Berliners crossing through the no-mans-land into the West Berlin on 11. November at Potsdamer Platz. Germany, 1989. 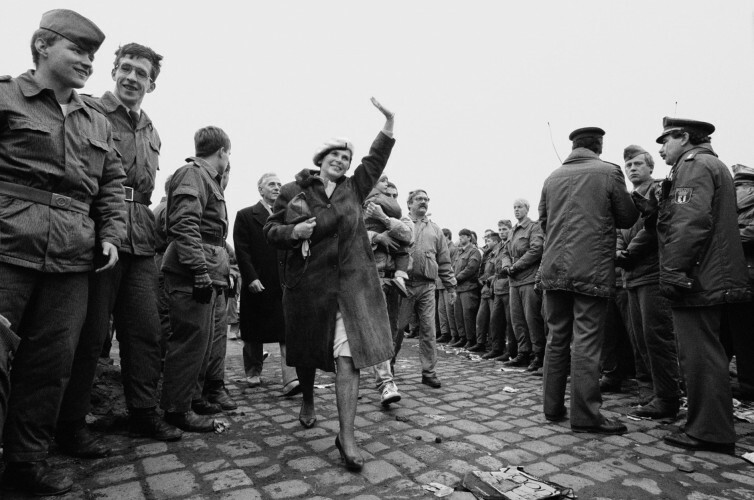 East German border guards and West German police cooperating in the crossing of East Berliners into the West Berlin on 11, November at Potsdamer Platz. Germany, 1989. In 1989 Kai Wiedenhöfer photographed the fall of the Berlin Wall in his hometown, and was deeply moved by this experience of history unfolding. At the time, Wiedenhöfer, like many, believed this event would mark the end of walls being employed as political tools and dismissed them as anachronistic instruments of division. Thirty years later, history has proved us wrong; indeed walls have enjoyed a barbaric renaissance. Border barriers have been erected in the US, Europe, and the Middle East in the aftermath of political, economic, religious and ethnic conflicts. Wiedenhöfer has documented walls in Belfast, Ceuta and Melilla, Baghdad, Israel & the Occupied Palestinian Territories, the American-Mexican border, Cyprus, Korea, the Greek-Macedonian border, United Kingdom – France as well as the remains of the Iron Curtain. CONFRONTIER presents Wiedenhöfer’s comprehensive ongoing project and evidences his conviction that walls are not solutions to today’s political and economic problems, but proof of human weakness, error and our inability to communicate with one another.